The ghost train hire is a classic fairground ride that will scare and shock guests. The guests climb into their carriages then the fun begins, they go through sections of the haunted house, there are skeletons jumping out, cobwebs which attack guests and all the spooky extras you could imagine. Why someone would invent a ride that scares people is quite strange, but it works and it is a very popular fairground ride. The ”ghost train hire” is busy all year round but especially at Halloween, so book early. We hire ghost trains throughout the UK and they are a dying breed, there are not many of these rides left. We have all the fun fairground rides available and they are great attractions at events. The great thing with the fairground rides is that they keep large numbers of guests occupied. The ghost train hire is the classic traditional fun ride, a little scare didn’t hurt anyone and this is great fun for children and adults. The ghost train ride is a firm fairground favourite. 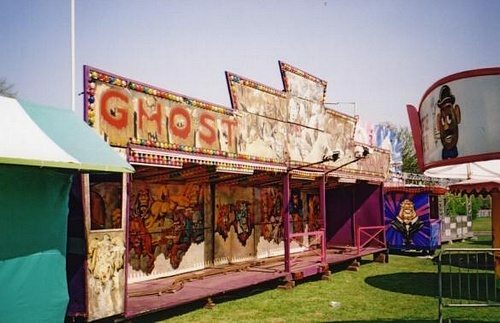 We hire fairground rides and hire funfair rides and the Ghost train is one of the most popular. We hire ghost train rides throughout the UK and they are all fully booked at Halloween. The ghost train for hire is available throughout the year. Hire ghost train ride for your next event and you will give guests a great thrilling experience. We hire fairground ghost train rides throughout the UK and they are always very popular. We hire fun fair ghost train rides to a wide range of clients. The traditional fair rides are some of the most popular. Our traditional fair ground rides are always in demand. Our corporate fair ground hire is the best in the industry and we have the top suppliers. For funfair ride hire for your next event give us a call. Fairground ride hire is popular amongst all guests. We offer ghost train hire to a wide range of clients from company parties to universities and they are always very popular. We have all the other fairground rides available also and all the fairground side stalls and fun games. We can create your own mini fun fair. We also supply all the other fun interactive games like the batak walls, the cash cubes and the fun casino tables so can organise your whole event if you wish? We have a wide experience of supplying games and can create the perfect mix of equipment and entertainers for your next event. Ghost train hire is superb at every party.